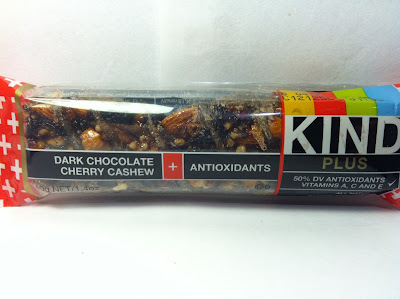 When I made my initial decision to put an increased focus on doing reviews of KIND bars, I picked up a handful of these at Kroger on sale and I've finally made my way through that handful with this review of the KIND Plus Dark Chocolate Cherry Cashew + Antioxidants Bar. Like I said, this one was picked up at Kroger on sale for $0.99 and it comes in at 1.4 ounces with 180 calories and four grams of protein. It's more of an antioxidants bar than a protein bar, so that would explain the low protein count. It's also gluten free and wheat free, so it's free of a lot of things. Hopefully flavor is not one of those. As you can see (and as I could smell when I took this out of the wrapper), this one has a lot of dark chocolate. Like I just mentioned the smell of the dark chocolate was quite strong and the ample presence of the dark chocolate actually masked a lot of the ingredients in the mix of the bar. The components that were visible, other than chocolate of course, were large almond pieces and also dried cherries, cranberries and raisins. There were also small bits of peanuts and cashews spread throughout, but they were mostly obscured by the dark chocolate base and the decorative dark chocolate swirl on top of the bar. For a bar with cashew in the name, I would have expected more of these and less huge almond pieces. Still the abundance of what components that were visible made me quite anxious to dig in. Being that there was so much going on visually with this bar, there was a lot going on with flavors too. The dark chocolate was thick and somewhat creamy once you allowed it to melt in your mouth, but it was not sweet, although that's what I'd expect from the dark chocolate. The sweetness of the bar, which was mild, was provided by the abundance of the dried fruits, although the one that shined the most was the cherry flavor as it added a vibrant sweetness and a mild tart flavor to go along with the heart chocolate. In terms of the nuts in the bar, the almonds carried the flavor day as you'd expect them to since they were in such large quantities. 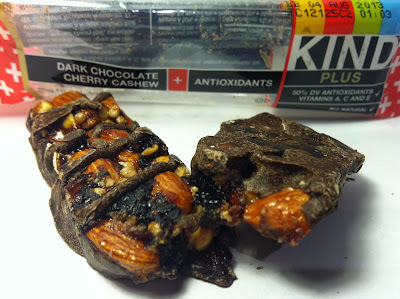 For such a strong presences of nuts in this bar, it was actually very chewy with a small, occasional pop provided by the almond pieces and that's the kind of mouthfeel that I've grown to expect from these KIND bars. Their deceptive in that respect (crunchy "appearance" vs. chewy mouthfeel) and I actually kind of like it. It is similar to the creatine supplements that are chocolate and wheat based. It packs quite a protein punch and has low sugar content. Perfect for survival in the wilds.